This page presents a dissection of the new Minecraft Alpha protocol by aera (Andrew Godwin), ylt (Joe Carter) and TkTech (Tyler Kennedy). Additionally, credit goes to the citizens of #mcdevs who helped by providing packet dumps and insight. If you're having trouble, check out the FAQ. Note: While you may use the contents of this page without restriction to create servers, clients, bots, etc… you still need to provide the attribution above if you copy any of the contents of this page for publication elsewhere. All types in Java (and as such Minecraft) are big-endian, that is, the most significant byte comes first. The majority of everyday computers are little endian, and using most programming languages will require converting big endian values to little endian. This is a fairly lengthy page, and to make it more readable certain terminology must be understood. Terms used on this page and their definition are provided below. There are several different units of measurement used in the protocol depending on what is being described. For example, it wouldn't make much sense to send the position of a block (which is a constant multiple of 32) in a floating point double. double Represents an objects exact location in the world, specified in block coordinates. int Represents an objects approximate location in the world, specified in pixels. This is the Absolute position cast to an integer, thus losing precision. int or byte Represents a blocks exact location in the world. Block = Absolute / 32.
int or short Represents the exact position of a chunk. Chunk = Block / 16. This packet may be sent by the client to keep the connection alive, or may be a relic of UDP testing. No one is really sure. What we do know is that the server will disconnect a client if it doesn't receive at least one packet before it increments a variable 1200 times. Sent by the client after the handshake to finish logging in. If the version is outdated or any field is invalid, the server will disconnect the client with a kick. If the client is started in offline mode, the player's username will default to Player, making LAN play with more than one player impossible (without authenticating) as the server will prevent multiple users with the same name. This is the first packet sent when the client connects and is used for Authentication. A message longer than 100 characters will cause the server to kick you from the server. This limits the chat message packet length to 103 bytes. Note that this limit does not apply to incomming chat messages as the server may have prepended other information, not limited to, but usually including, a username. Sent by the client whenever the inventory is modified (item destruction, pickup, crafting, etc…). For details, see here. This packet is new to version 4 of the protocol, and is believed to be Use Entity. Seems to be true when the player is pointing at an entity and left-clicking and false when right-clicking. Sent by the client when the player presses the 'respawn' button after dying. 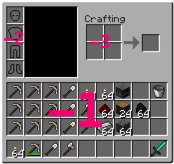 The server then drops the player's inventory and teleports the user to the spawn point. Updates the players XYZ position on the server. If Stance - Y is less than 0.1 or greater than 1.65, the stance is illegal and the client will be kicked with the message “Illegal Stance”. Updates the direction the player is looking in. Yaw is measured in degrees, and does not follow classical trigonometry rules. 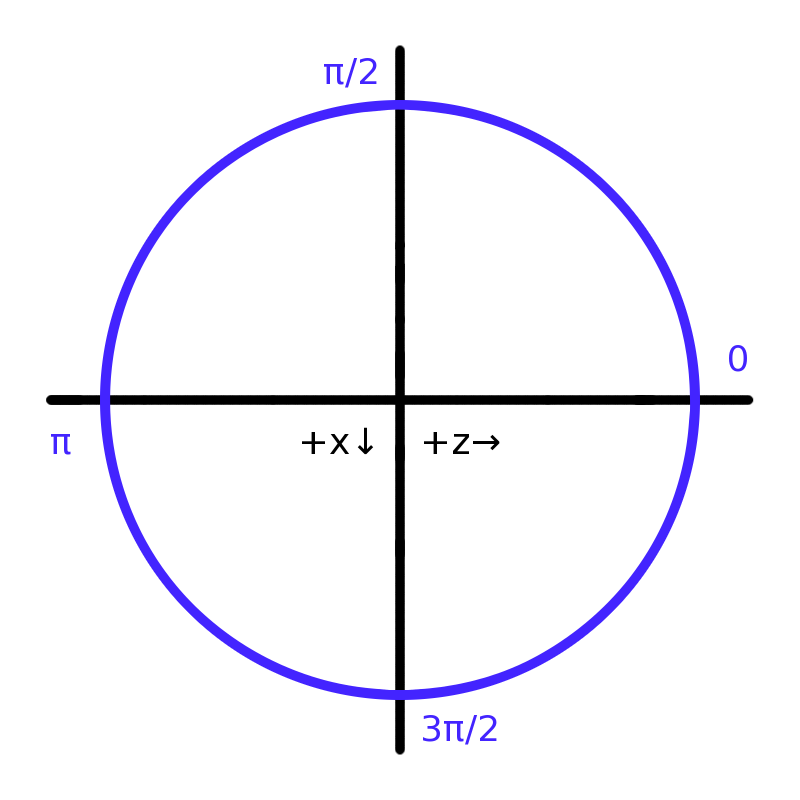 The unit circle of yaw on the xz-plane starts at (0, 1) and turns backwards towards (-1, 0). A combination of Player Look and Player position. When the server sends this packet to the client, the Stance and Y are swapped, see server Player Position & Look packet. Sent repeatedly as the player mines a block. This packet has a special case where X, Y, Z, and Direction are all -1. This special packet indicates that the currently held item for the player should have its state updated. The block or item ID corresponds to whatever the client is currently holding, and the Alpha client sends one of these packets any time a right-click is issued on a surface, so no assumptions can be made about the safety of the ID. Sent when the player changes the item or block currently being held. Sent whenever someone swings their arm. A pickup spawn is sent from the client to the server whenever the client drops an item they are holding. This identical to the pickup spawn packet that is sent from the server to the client. Sent by the client when it's doing a clean disconnect. This packet may be sent by the server to keep the connection alive, or may be a relic of UDP testing. No one is really sure. Sent by the server if it accepts the clients login request. If it didn't, it'll send a kick instead. This is the first packet sent when the client connects and is used for Authentication. If the hash is '-', then the client continues without doing name authentication. If the hash is a '+', the client sends the server password in the login request. The default SMP server increments the time by 20 every second. The current time ranges from 0 to 24000. Sent by the server to set or reset a players inventory. This includes the main inventory, equipped armour and crafting slots. Packets for all three types are sent to initialize the players inventory before spawning them. This packet is a bit more tricky to parse than most others because the size of its payload is variable. The payload is an array of shorts (item ID) optionally followed by a byte-short pair (count and uses) as long as the item ID does not equal -1, which signifies an empty slot. Uses is the number of times an item has been used (the value starts at 0 and counts up.) Note that an invalid use of an item may count as 2 uses. Sent by the server after login to specify the players starting location and to initialize compasses. It can be sent at any time afterwords to update the point compasses are focused on. Sent by the server to update/set the health of the player it is sent to. Added in protocol version 5. Sent by the server after receiving a respawn packet from the client. The client will not leave the respawn screen it seems until this packet is received. This packet differs from client Player Position & Look packet, the Stance and Y are sent in a different order, however because of the different order this is sent the client will actually use the X,Y,Stance,Z client layout. 0x10 EID? int 6341424 Player EID? Sent by the server when a player has become close enough to collect an item on the ground. “Life” can range from 0x01 (full health) to 0x32 (no health), 0x00 omits the health bar altogether, and is what should be used for blocks. Sent whenever an entity should change animation. Animate byte 1 Can be 0 (no animation), 1 (swing arm) or 2 (death animation?). Getting 102 somewhat often, too. The only named entities (at the moment) are players (either real or NPC/Bot). This packet is sent by the server when a player comes into visible range, not when a player joins. A pickup spawn is sent whenever an item on the ground (say a pickaxe thrown on the ground) comes into range of the player. Sent by the server when someone picks up an item lying on the ground - its sole purpose appears to be the animation of the item flying towards you. It doesn't destroy the entity in the client memory (0x1D does that), and it doesn't add it to your inventory (0x11 does that). Sent by the server when an Object/Vehicle is created. This packet is new to version 4 of the protocol, and is believed to be Entity Velocity/Motion. Sent by the server when an Entity is to be destroyed on the client. Most entity-related packets are subclasses of this packet. When sent from the server to the client, it may initialize the entry. This packet is sent by the server when an entity moves less then 4 blocks, if an entity moves more then 4 blocks Entity Teleport should be sent instead. This packet is sent by the server when an entity rotates. This packet is sent by the server when an entity rotates and moves. This packet is sent by the server when an entity moves more then 4 blocks. This command is not fully understood. This packet is new to version 4 of the protocol, and is believed to be Attach Entity. This packet is sent by the server to notify the client to initialize (Mode=1) or unload (Mode=0) a chunk. The client is expected to allocate space for a full chunk (currently 16 x 128 x 16 blocks). One or more 0x33 packets will follow, specifying actual data to fill the chunk with. Whenever you send this packet the client will clear any previous chunk at that spot if one has previously been sent. Clients don't like being in or next to an unloaded chunk, so try not to unload it if players are nearby. If the player appears to be twitching and stuck in place after joining the world, there is probably an unloaded chunk too close to them. A server can send a 0x32 packet prior, allowing the client to initialize the chunk. However this doesn't always happen in practice. Thus the client should initialize the chunk on-demand. Compressed data byte array … The region data is compressed using ZLib Deflate function. This is the start position of the region, in world block coordinates. This is the size of the region, in blocks. The server will subtract one from the sizes and then cast them to a byte before sending. This is so that chunks as large as 256 are possible (the maximum size of a byte is 255; 256 - 1 = 255). The data is exactly (Size_X+1) * (Size_Y+1) * (Size_Z+1) * 2.5 bytes long. In other words, there are Size_X number of x planes, each plane made up of Size_Z number of z rows, each row made up of Size_Y blocks indexed by y coordinate in order. The other arrays are similar but you need to divide the index by two after calculating the above. Then each byte contains data for two blocks. Further investigation shows that this is a multiple-block-change command; if you take the three arrays, and put together elements with the same index, and then decompose the short into coordinates (top 4 bits is X, next 4 bits is Z, bottom 8 bits is Y), you get things like [((8, 7, 4), 11, 0), ((7, 13, 6), 11, 0), ((13, 1, 8), 11, 0), ((7, 6, 6), 11, 0)]. See the Block Change command for description of the general format of a block change. Block metadata varies by block type - it should be 0x00 for most blocks with a few exceptions, shown in the table below. This is a complex packet used to send entities including their entire NBT representation. This packet is currently used for furnaces, chests, signs and mob spawners. This packet is only temporary, and used for rapid prototyping of new types of entities. Specialized packets for each object will eventually be added. Seems to be sent when an explosion occurs (both creepers and TNT). Record count int This is the count, not the size. The size is 3 times this value. Records byte array Each record is 3 bytes, which seem to be XYZ offsets of affected blocks. Sent by the server before it disconnects a client. Provided below is a changelog of the server protocol starting on 2010-08-20. The wiki history feature may also be used to investigate changes.